Unearthing The Mysteries Of Ancient Filipino "Giants"
This was the story told in whispers and passed on from one generation to the next about the alleged giant race—the Dinagats–that once populated the small tadpole-shaped island of Samal across the Davao Gulf, over 200 years ago. 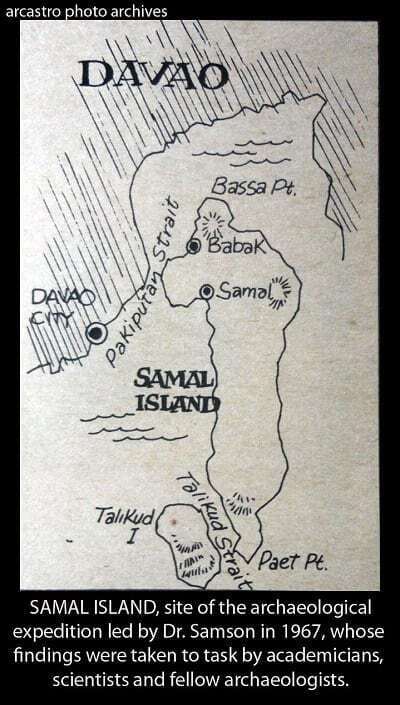 All the more was this given credence, when, in September of 1967, a team of student anthropologists from Davao’s University of Mindanao, led by Dr. Jose A. Samson, embarked on an expedition to the rocky Punta Libod promontory jutting out to the sea. It was hardly explored by the people of Tagobo, the nearest sitio just a kilometer away, for they believe that the spirits of the dead resided there, and they were not to be disturbed. True enough, in two small caves found at Punta Libod located 18 feet from the sea level, Dr. Samson and his team found centuries-old coffins containing various artifacts and remains in various stages of preservation. There were highly eroded bones of normal-sized Samal natives who died over 120 years ago. 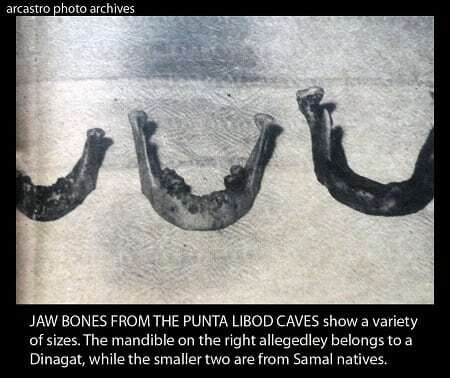 Dr. Samson surmised that the Samals may have taken over these burial caves from the Dinagats after the race died out. Among the assorted bones and dug-up artifacts was a jaw bone of a relatively big-sized human being and the facial portion of the skull that belonged to different individuals. Both had peculiar characteristics. 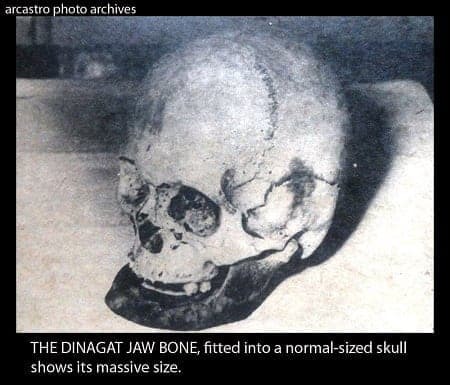 The jawbone, asserted Dr. Samson, was definitely bigger than that of any large-sized Filipino. Reconstructing the height of the individuals who owned the bones with the use of the Pearson height estimation formula, Dr. Samson concluded that the extinct Dinagats were from “five feet four to five feet seven inches in height” (the average height of British men in the 1700s was 5’6”). The news of the discovery of “Samal Giants” created a widespread buzz in the academic and scientific circles. 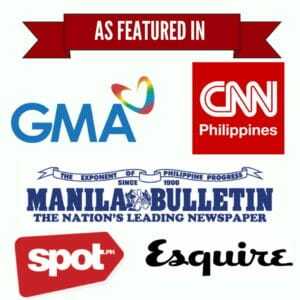 The first to voice his dissension was a colleague of Dr. Samson himself, Prof. Antonio Dagdag of the University of Mindanao, who claimed that no such people existed in the islands—that the so-called “Dinagats” could be the same “Dumagats” living in Bukidnon, perhaps driven out from Samal by Muslims. This applies to the “frontal skull curvature” measurements as well, which was a new way of comparing skulls. 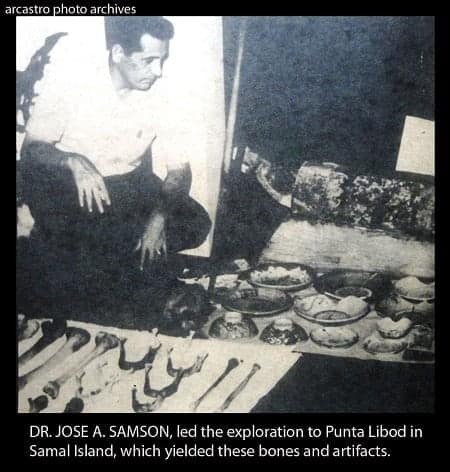 No such records of measurements are available for either “Filipino” or “Samal” skulls. Furthermore, “Filipino” is a national category, not a racial category. Dr. Samson too did not explain the significance of the computed statures of 5’4” to 5’7”–a range still common among living Philippine populations. Moreover, Pearson’s formula used by the doctor was derived from European white populations, and therefore, should be cautiously applied to non-European specimens. Besides, there are other more accurate formulas for determining heights, for example using leg bones. The photographic evidence was also questioned by many anthropologists. The massive Dinagat jaw bone was not convincing and could have come from an extremely aged individual, or one who has lost many teeth. It was also possible that a larger male jaw may have been paired with a female “normal adult-sized skull.” As to the variances in the sizes of the mandibles (lower jaw) presented in the picture, this could be attributed to sexual and age dimorphism. Finally, “big people” in oral folk history are very common—not just in the Philippines, but also in other foreign lands. Confirmatory information relative to archaeology should have been extracted from folk stories of people as part of the corroborative data. 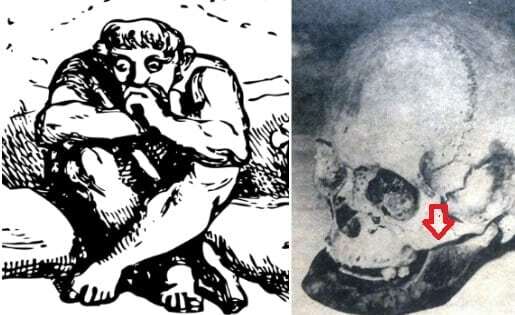 The mystery of the Samal Giants seemed to have been solved after the premises and findings of Dr. Samson were debunked, its reputation as an “island of the giants” now just a tall tale–and a part of its mythology. 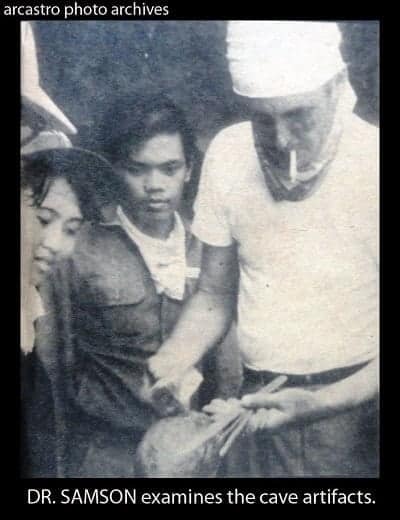 Ranido, Florencio A. Relics of a Lost Tribe, The Sunday Times Magazine, 14 July 1968,p. 22-23. Bailen, J.B., Evangelsita, A.E., Francisco, J.R. The ‘Samal Giant” Story: Cutting it Down to Size. The Sunday Times magazine, 1 September 1968,pp. 26-28.